Dennis and Christian were kind enough to let me come on and the share news about my military art project, Project 52, which helps to raise funds for military families who are financially challenged, given through USACares.org. Here is the link: http://www.indiegogo.com/Project-52. Last year at this time we auctioned my Transformers painting, which was the first-ever illustrated cover art for GEEK Monthly magazine for their special Comic-Con issue, juxtaposing the “old school” Transformers character vs. the modern day version. I donated all of that money to USACares.org. Today, I’m asking you to help me spread the word about Project 52. Please post it on your FaceBook, Twitter, MySpace and LinkedIn accounts, and anywhere you connect with your social networks. On Twitter or Cinchcast, the hashtag reference is #Project 52. Please tell your military friends and your family about Project 52. For just $5, you or the person you designate will be mentioned in my Project 52 book, which I’m self publishing. For $1,000, you can own a Dave Dorman original oil military painting. There are tons of contribution opportunities and options between the $5 and the $1,000 range, but please contribute whatever is comfortable for you, even if it’s just words of support. The initial $52,000 we are raising will cover expenses for publishing the book, art materials, printing the limited edition signed and numbered lithographs and helping to defray costs for me taking time off of commercial work to focus on this project. Fifty percent of all earnings from the books and lithos will go to USACares.org. The remaining 50% of book and lithograph sales will go to the Make a Wish Foundation in honor of Katie Johnson (501st founder Albin Johnson’s late daughter) on behalf of the 501st Organization, for which I’m honored to be an honorary member. For those of you reading who are unfamiliar with the 501st, these are the great men and women worldwide who donate their time, wearing Star Wars costumes and marching in parades, visiting children’s hospitals and continuing to be good will ambassadors of Lucasfilm. I thank you all for your kind words and moral support. I’m very passionate about doing Project 52 and ensuring it is done to perfection. We are still in the throes of unpacking from our big move, and the other day I discovered the old reel-to-reel audio tape recordings of my father, from when he was serving on behalf of the United States Air Force in Viet Nam. We didn’t see my dad for an entire year, so we communicated with him solely by letters and tapes. I’m getting these recordings made into CDs for my sister and brother, but if you know of a military museum out there who might want some of these recordings, please let me know. As always, I thank you for reading and following my work. Art: You may as well copy and paste my praise for David Messina’s art from #1 in here. One thing you can leave out, though, is my gripes about Gunn’s inconsistent beard. The art in this issue is 100% consistent, and Messina added that he would be fixing Gunn’s beard for the collection. Covers: Both of these covers are considerably better than the ones from the first issue. The Messina cover is at once brutal and beautiful, featuring an image of Gunn in creepy blue lighting that makes his eyes all shadowy, with an image of Gunn as a vampire slicing through the middle of the issue. The same format is used for the rest of Messina’s covers in this arc, and I love it. And this time, Dave Dorman’s cover is just as great as Messina’s. Over a beautiful blue and purple backdrop, Gunn and Illyria, all promed-out, are dancing. Gunn dips Illyria, and to his horror, demonic tentacles whip up in front of them. That could be collection cover status. Dave Dorman rendered the cover art for this work. Mr. Dorman is by no means the only artist that creates the visual work for this and other Star Wars Series, but I have always felt he is one of the best. I wish I could say the same for the collection of short stories profiling some old friends and some new, but that would be a stretch for even science fiction. I’d also like to thank those critics out there that occasionally give me a negative review, because it emboldens me to work harder. As for my latest news, I’m looking forward to seeing Todd Rundgren on Sunday in Chicago with The Devil’s Candy Store co-founder Charlie Athanas. I’m also hopeful that I will be a guest on The Dennis Miller Radio Show when he comes into Chicago next week. As many of you know, I am a fan of Dennis’ from more than 20 years back, and it will be a lot of fun to talk with him and his producer Christian in person. My wife ran into Dennis at San Diego Comic-Con, and it all sort of evolved from there. 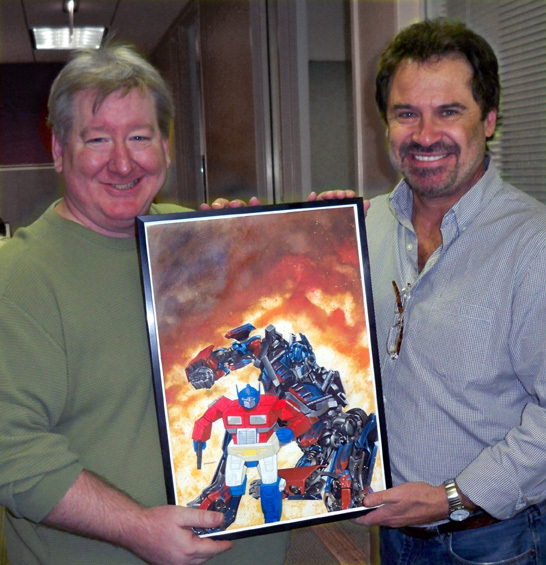 I am donating my Transformers painting, which was the cover art for GEEK Monthly Magazine’s San Diego Comic-Con special edition issue, to Dennis Miller’s favorite charity, http://www.USACares.org. This helps military families financially, and as many of you know, I am a USAF military brat, so that is near and dear to my heart. If you get a chance to visit Windy City Con, be sure to say hello to my friends and special guests Tony Aikens, Mike Kennedy and Alex Wald. Thanks for reading, everyone. I will do my best to post updates more regularly.